Total worldwide enterprise storage systems factory revenue grew 2.1 percent year over year to US$8.8 billion during the second quarter of 2015 (2Q15), according to the International Data Corporation (IDC) Worldwide Quarterly Disk Storage Systems Tracker. Revenue growth was strongest within the group of original design manufacturers that sell directly to hyper-scale data centres - this portion of the market was up 25.8 percent year over year to US$1 billion. 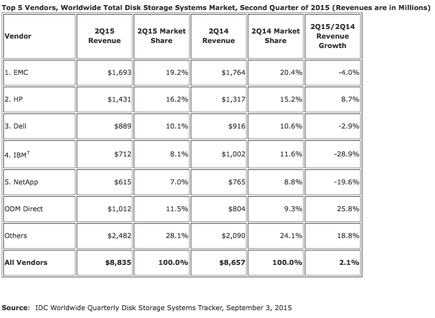 Sales of server-based storage were up 10 percent during the quarter and accounted for $2.1 billion in revenue. Meanwhile, external storage systems remained the largest market segment, but the US$5.7 billion in sales represented a -3.9 percent year-over-year decline - total capacity shipments were up 37 percent year over year to 30.3 exabytes during the quarter. “Companies are increasingly using new project initiatives and infrastructure refresh as an opportunity to deploy new storage technologies that are able to drive cost and complexity out of their existing storage resources,” says Eric Sheppard, Research Director, IDC Storage. 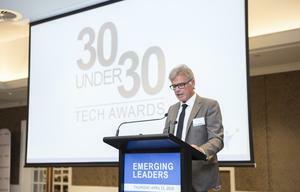 “This is pushing critical investment dollars towards technologies like cloud-based storage, integrated systems, software-defined storage, and flash-optimised storage systems at the expense of traditional external arrays." 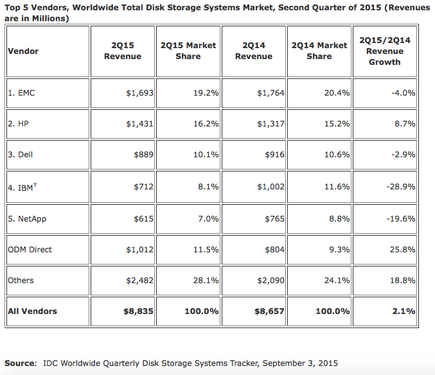 EMC finished in the top position within the total worldwide enterprise storage systems market, accounting for 19.2 percent of all revenues in 2Q15. 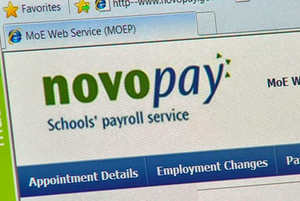 HP held the number 2 position with 16.2 percent of spending during the quarter. Dell accounted for 10.1 percent of global spending. As a collective group, storage systems sales by original design manufacturers (ODMs) selling directly to hyper-scale data centre customers accounted for 11.5 percent of global spending during the quarter. 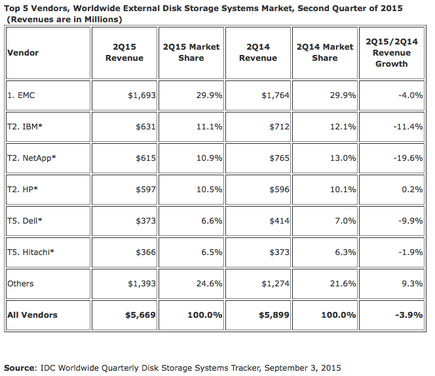 EMC was the largest external storage systems supplier during the quarter with 29.9 percent of worldwide revenues. IBM, NetApp, and HP finished the quarter in a statistical tie for the second largest ranking with revenue shares of 11.1 percent, 10.9 percent and 10.5 percent, respectively. Dell and Hitachi were also a statistical tie with the two companies earning 6.6 percent and 6.5 percent of worldwide external storage revenues during the quarter. The total open networked disk storage market (NAS Combined with non-mainframe SAN) generated US$5 billion in revenue during the quarter. 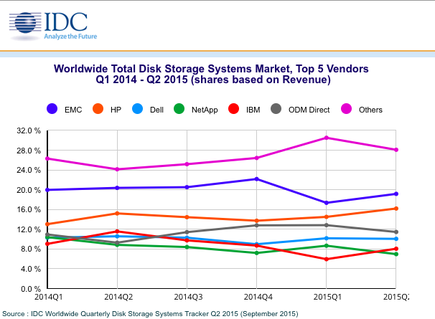 EMC maintained its leadership in the total open networked storage market with 32.4 percent revenue share. 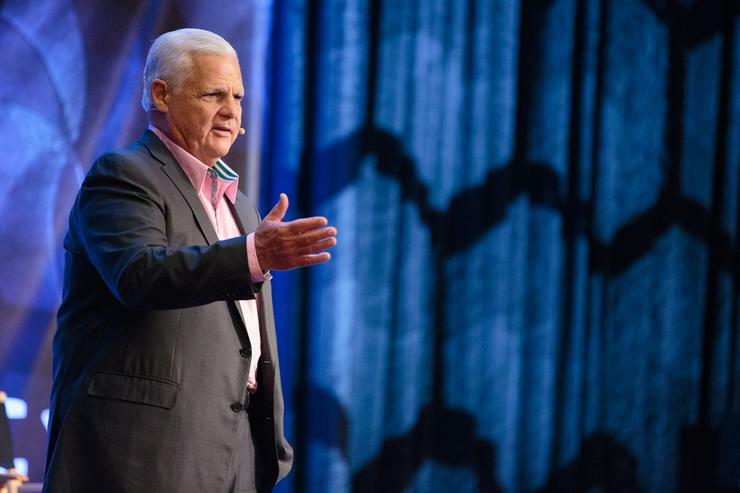 NetApp generated 12.3 percent of revenue within this market segment.